Our Patients or their relatives often donate money to the Practice, either as a personal gift, a bequest or from a fund raising activity. This is very kind and all these donations are much appreciated. The Friends of Fordingbridge Surgery was established as a registered charity in 2001, primarily to responsibly manage these donations in order to provide the best benefit for our patients. The Friends maintain a fund-raising calendar, organised by an enthusiastic new Trustee helped by a few volunteers from within our membership. Proceeds are used to fund the purchasing of equipment or improving facilities in areas of the Practice that may not be adequately met by the NHS funding. The Friends' aim is to improve the experience of patients using the Surgery, and to enhance its facilities to a level of excellence. Other important work for the Friends is to maintain an active dialogue with the Patient Participation Group, and to try to understand more clearly the areas of the Surgery that may be improved. A Patient Satisfaction Survey is completed annually and appraised by the Friends with the intention of service improvement. The Friends are currently chaired by Mr Ian Newman ably supported by a small executive committee. 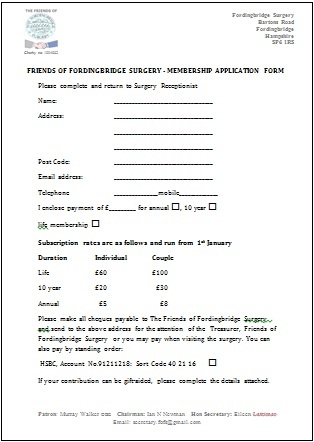 Details of membership, equipment purchased and fundraising events may be found with the current Newsletter on the Friends’ notice board in the main waiting room at Fordingbridge Surgery. Anyone who would like to be involved with the Friends would be most welcome and should contact the surgery.